Play-Doh is Power - Be your best teacher! Working with teenagers on Friday afternoons can be difficult but I decided to spice things up this week with my lesson on the early river valley civilizations. My students jumped out of their chairs and cheered when I told them they would each receive their own “Play-Doh ” – no longer just for toddlers! I had them create their own names and pictograms in cuneiform. Thank you to the Penn Museum for inspiring this activity! First I had my students go to their website: https://www.penn.museum/games/cuneiform.shtml They were asked to write their own names down in their notebooks in cuneiform as shared by the website. Then I gave each student an individual Play-Doh (see below) and a popstick (since reed stylus pens were not available like they were in Sumer 🙂 ). 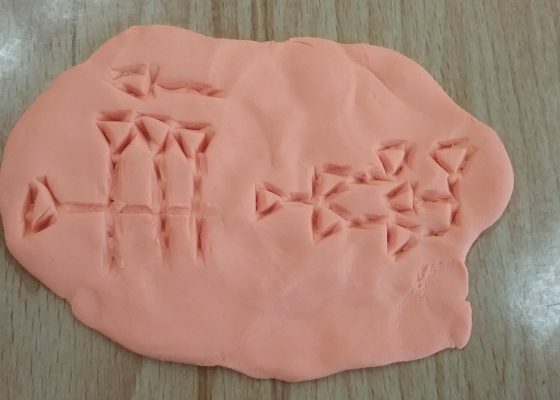 Students carved their names in cuneiform into the Play-Doh. They were smitten! To extend the activity I asked them to make their own pictograms in the playdough and have other students guess what the words meant (in groups of four students). We then discussed the origins of writing and what the advantages were for a civilization to use writing vs pictograms. A great discussion on emojis emerged and how difficult it could be to use a pictogram to communicate via text message! They walked out the classroom high fiving me and smiling. Job well done for the week. I plan to have my students do an abridged version next week with hieroglyphics! Play-Doh can be powerful in the classroom. Have you tried out this activity? Here are some of the fun Play-Doh creations! Previous Post First day back! Next Post History Class Can Be Fun!